You've found the “U.S. Lowline Cattle Breeders” page here at Hobby Farm Wisdom! If this is the first time you have visited our site: Welcome! 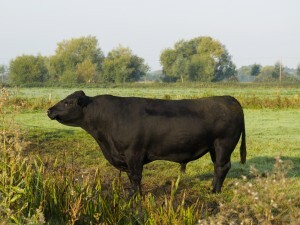 Lowline is smaller, naturally polled beef cattle originally bred in Australia from the black Aberdeen Angus cattle. Their origin revolves around a research project involving low growth rate cows. It is this research, not a presence of the Achondroplasia or dwarfism gene, which explains their small stature. They are very small compared with other breeds, standing at only 3 ½ feet tall and topping out at 1,300 pounds. Lowline cows have the unique characteristic of not cycling until they have reached approximately 500 pounds, giving small farmers the advantage of leaving them out to pasture longer without risk of conceiving.